Stacy Winsberg has won softball championships on the high school, college, ASA and international levels. In 1984 and 1985, she was named an ASA All-American. 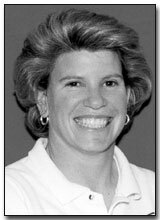 UCLA star Winsberg scored the winning run at the first NCAA Women's Softball Championship in 1982, helping the Bruins to the national title. After a NCAA third place finish in 1983, she, again, was instrumental in leading the Bruins to NCAA titles in both 1984 and 1985. Batting second, behind Dot Richardson (considered one of the greatest female players of all-time), Winsberg set UCLA career and single season records for sacrifices. She was a four-year all-star at second base and in the outfield. Before college, Winsberg led Granada Hills to the 1980 City championship, and was a four-year All-City selection. While playing ASA ball, she was a key member of the 1981 and 1982 California State Champions. At the 1982 championships, her .721 batting average was an event record and earned her MVP honors. In 1983, Winsberg helped her team to the Olympic Festival Gold Medal at Colorado Springs. Winsberg’s U.S. squad won the ASA National title in 1984, and finished third in 1985 and 1986.